Apparently G-d thinks it’s too easy to get laid for men 33-58. Seriously, Lord, if that is your real name, thanks for the ear hair. Thanks for allowing hair to grow on and out of an ear. Oh, don’t worry- it doesn’t effect hearing at all- one can still hear the screams of terror of anyone who happens to look an “ear-hair victim” in profile. Reason #10 Zillion that religion is full of poo-poo: the dueling concepts that G-d is a Divine Mystery of Perfection, and that man, whom He created in His image, has ear hair. So either the Big Guy upstairs is NOT perfect, or he is, and looks like your Uncle Frank who in turn, looks perfect. Something to think about the next time your asked to fork over a few bucks for the collection at your local parish- you’re giving money to someone who looks like your Uncle Frank. Might as well just give the coin to Uncle Frank, he probably needs to buy some smokes. 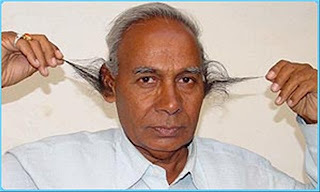 In the meantime, press G-d for an answer on why ear hair exists and you won’t get one. 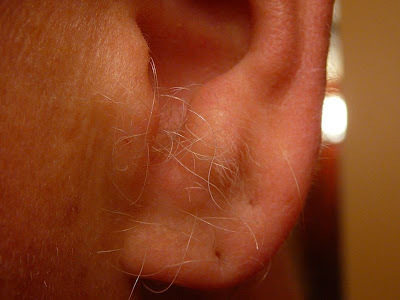 It can’t be “ear warmth”, there’s far too little hair on the average ear for that. Was it an insurance policy against runaway self-esteem in men as they age? Perhaps. Either way, thanks G-d for the ear hair, seriously we appreciate it. And thanks for only giving us this as a weapon against it.